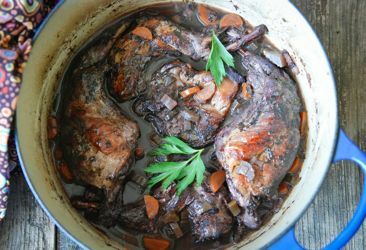 Santa Cruz community member, Robin Myers-Colleen says “It is a tradition in our house to eat rabbit during the holidays. Last weekend, inspired by ingredients from farm market vendors, I got busy.” Feel free to pass this recipe on and find your own inspirations at your local market. Preheat oven to 350 degrees. Clean Cippolini onions by scraping the bottom root clean and topping the onion, being careful to keep the onion intact without removing the core which will hold it together during cooking. Remove yellow skin, easiest done under cool running water. Cut the rabbit into frying pieces by removing 2 leg/ thigh portions, then the 2 arm/ shoulder portions. Cut the remaining body of the rabbit in half down the spine. Divide it into 4 pieces, 2 breasts and 2 loins. Generously season the flour with salt and pepper, and then dredge rabbit pieces in flour. Preheat a cast iron skillet or casserole on the stove top. Add the olive oil. When it sizzles, add the rabbit pieces and brown on all sides. Remove rabbit to a separate plate. If needed, add a bit more olive oil to the skillet. Add the onions and brown on both sides. Remove the onions; add the rabbit pieces and then top with the onions. Slowly pour in the wine and let it come to a boil. Immediately cover the casserole, and set into the 350 degree oven. Bake for 45 minutes. The sauce should have thickened on its own, but if not, remove the rabbit and onions to a warmed platter. Put the skillet on the stovetop over medium heat. Whisk a tablespoon of flour into the sauce, and stir until slightly thickened. Adjust salt to taste. Pour over the rabbit and onions. Serve with wild rice or parapadelle noodles.